The affordably priced Model DS6150 Remote Indicator Scale satisfies a variety of applications with a versatile design. Whether your application is a physicians office, acute care or visiting home nurse, the DS6100 can meet your needs. Have the patient step onto the low-profile DS6150 platform and an accurate weight up to 500 pounds will be held on the display. The Weight Lock feature, a Doran exclusive, allows an accurate weight to be displayed reegardless of a patient’s movements. The Reweigh feature allows a second weight to be acquired while the patient remains on the platform. Power is provided by the included AC adapter. If AC power is not available or reliable, this portable medical scale can be powered by six AA batteries (not included). Standard USB and RS-232 communications ports allow the recording of a patient’s weight and BMI value by an EMR/EHR system. Model DS6150-Wifi has all the same features with the addition of Wi-fi communications over a secure wireless protocol. 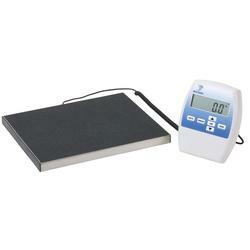 Note: The Model DS6150 Portable Medical Scale is the replacement of the discontinued DS6100 medical scale.